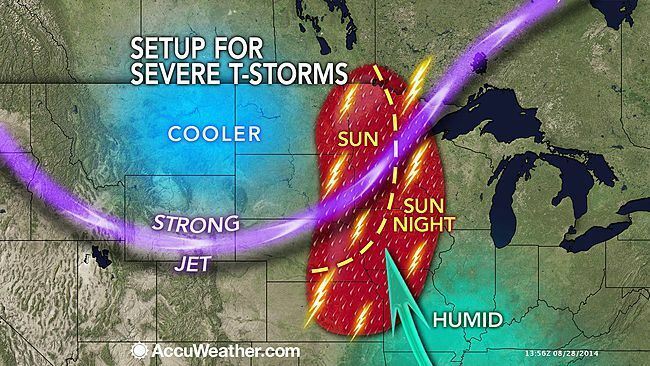 Severe storms and tornadoes threaten lives and travelers on this Labor Day weekend in the North Central states. Warmth and humidity will build across the East Coast as sunshine holds in the Southwest. According to the American Automobile Association (AAA), approximately 35 million people will hit the roads and airports on the last unofficial weekend of summer. The number is the highest in six years for the holiday and may be associated with lower fuel prices and improving economic conditions. The strongest thunderstorms in the North Central states will be capable of spawning tornadoes, especially from eastern Nebraska to western Iowa and Minnesota. Prior to the outbreak, another zone of strong thunderstorms with hail and damaging winds will threaten western North Dakota Saturday afternoon and evening. Otherwise over the weekend, showers and thunderstorms will stretch from the Gulf Coast to the Great Lakes on Saturday, August 30. The most numerous activity will center on the lower Mississippi Valley and western Great Lakes, including Chicago, Indianapolis, Little Rock, Shreveport and Baton Rouge, Louisiana, Tupelo, Mississippi, and Houston. On August 31, the corridor of numerous thunderstorms will extend from the lower Mississippi Valley to the Ohio Valley to northern New England. A stray shower or thunderstorm will dot the I-95 corridor from Boston to New York City to Philadelphia to Washington, D.C., mainly Sunday afternoon. People traveling from the western Gulf Coast to the Great Lakes and northern New England will want to make provisions for indoor activities for at least part of their weekend. Enough rain can fall and thunderstorms could be locally gusty in this zone, perhaps to the point to cause isolated flash flooding and sporadic power interruptions. Travel delays would be a threat even if flash flooding does not unfold. Any downpours will reduce visibility for motorists and heighten the risk of vehicles hydroplaning at highway speeds. Airline passengers should prepare for possible flight delays from the downpours and lightning strikes. On Labor Day, many communities along the East Coast will have to contend with a shower or thunderstorm threatening outdoor picnics, parades and other festivities. This includes in Boston, New York City, Washington, D.C., Charlotte, North Carolina, Atlanta and Jacksonville, Florida. The sunniest locations on Labor Day weekend will be over the Southwest, along much of the West Coast states, part of the southern Plains and for a time along the middle part of the Atlantic Seaboard.